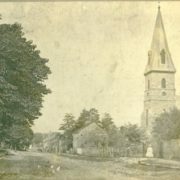 The Historic Shepherdstown Museum opens for the season on April 7 with a new temporary display of past and recent photos of Shepherdstown. In addition, visitors will be able to see a “new” Jacob Craft clock donated last fall by former Jefferson County resident Curt Mason. Beginning on April 7, the Museum will be open on Saturdays from 11 a.m. to 5 p.m. and on Sundays from 1 to 4 p.m. It is located at 129 E. German Street in Shepherdstown. 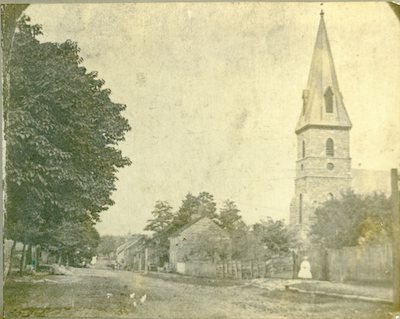 Last fall, local historian Doug Perks compiled past and current photos of Shepherdstown into a presentation called “The Changing Face of Shepherdstown.” He has now organized the photos into a display for the Museum. The display features images from as far back as the 1860’s and as recently as 2015. The Museum is also pleased to display its third early 19th century grandfather clock made by Shepherdstown resident Jacob Craft. 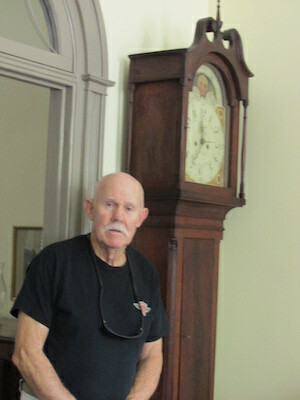 Curt Mason donated the clock to the Museum so that it could “come home.” The clock once belonged to Rezin Davis (R.D.) Shepherd, a Shakespearean actor in the first half of the 20th century. A great-grandson of the founder of Shepherdstown, R.D grew up at Wild Goose Farm, just outside of town. He eventually moved to California where he died in 1946. Having no close relatives, he left his Craft clock to his long-time housekeeper. The housekeeper’s daughter, Elizabeth Shepherd Saxe, was Curt Mason’s mother’s close friend and left the clock to her.